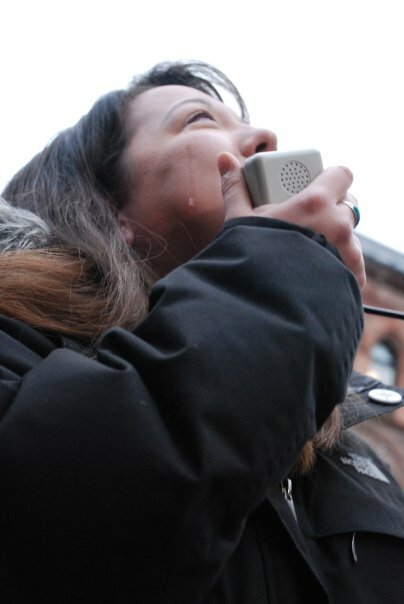 Here's a report on yesterday's Tar Sands action - and some photos, by Orin Langelle and Daygot Leeyos. 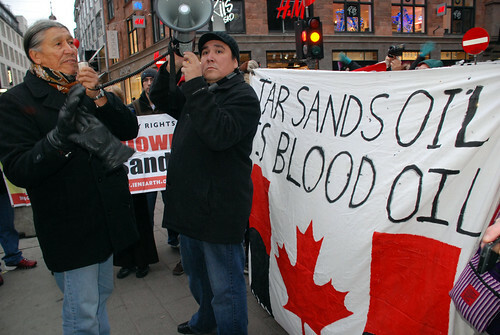 About 200 of us gathered outside the Canadian Embassy in Copenhagen to protest at the way Canada is blocking progress on binding, ambitious climate emissions reductions - because it's committed to expanding the most destructive project on earth: the Tar Sands. We had a noisy, colourful and at times emotional rally. We arrived to discover that, true to form, those delightful Danish police had retracted our protest license, so we had to gather across the street from the Embassy. Clayton Thomas-Muller from the Indigenous Environmental Network was our larger-than-life MC, and opened the proceedings with a traditional song and prayer. Then a series of Indigenous speakers spoke passionately about how Tar Sands extraction is destroying Mother Earth and hurting people in their communities: and for what? To fuel an oil addiction that is driving us into climate catastrophe. It's just nuts. 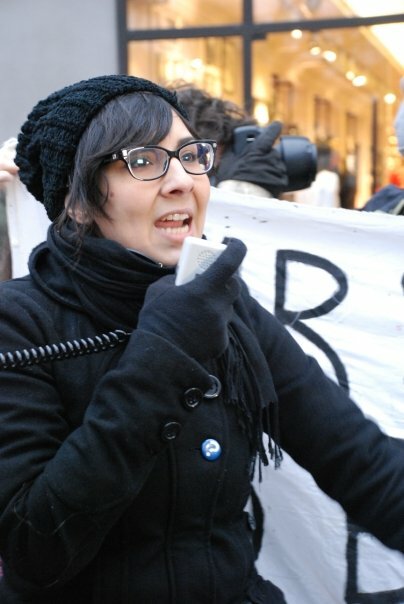 Eriel Tchekwie Deranger talked about how people in her community of Fort Chipewyan, directly downstream from the Tar Sands, are being poisoned by the food they eat and the water they drink. Many people are developing cancer as a result of the massive pollution imposed on their traditional lands. Kandi Mossett - herself a cancer survivor - delivered a passionate condemnation of Canada's decison to keep extracing this hugely carbon-intensive source of oil rather than making the transition to a green economy. Naomi Klein, who like many Canadians is appalled by the way her government is behaving like a bullying petro-state, then spoke. Then it was my turn: talk about a tough act to follow! 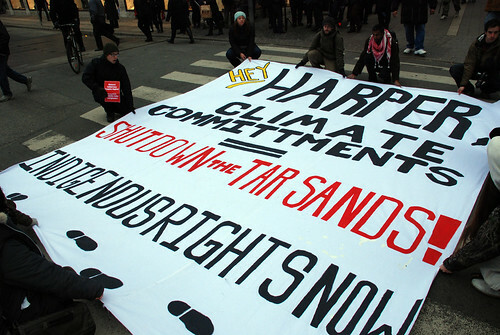 I talked about how the Tar Sands are not just a Canadian affair. They are also part of the UK's carbon footprint due to the heavy involvement of British companies and investors such as Shell, BP and Royal Bank of Scotland. 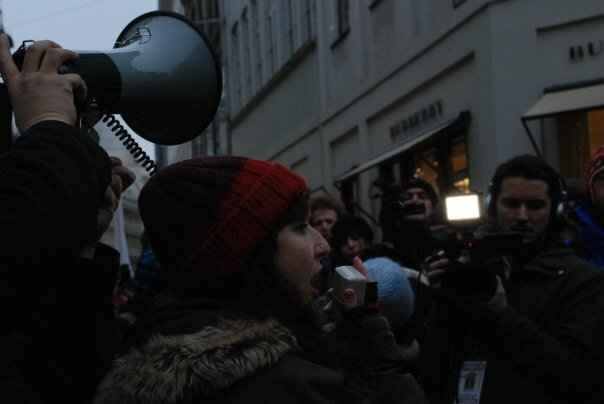 I was able to deliver the news that at that very moment a simultaneous protest was taking place outside Canada House in Trafalgar Square, London, in solidarity with ours. 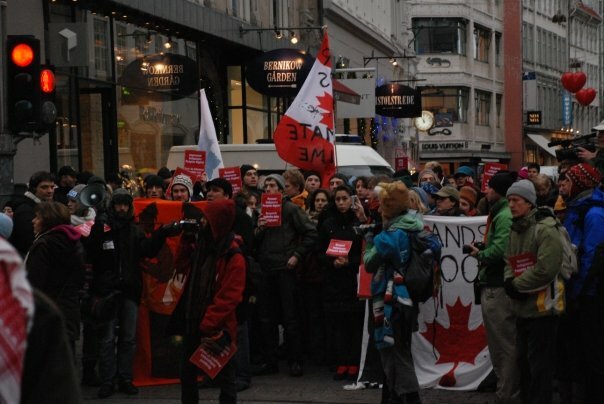 Then, after a few more speakers, I led the crowd in a rousing rendition of 'Blame Canada' - the song from 'South Park: the Movie' whose words we've bastardised to lay our collective blame squarely on the Tar Sands. Finally, a group of us went as close to the Embassy door as the cops would let us (which was not very) to lay out a welcome mat for Canadian Prime Minister, and drop off a welcome basket for him, containing goodies such as copies of all the Treaties with Canada's First Nations that the Tar Sands are contravening, a copy of the Kyoto Protocol (he's obviously forgotten to check his emissions reductions targets lately), a copy of the UN Declaration on the Rights of Indigenous Peoples, which Canada is one of only three countries to refuse to sign, and some 'Shut down the Tar Sands' stickers. Meanwhile, others blocked the street to lay out a huge banner. Canada's international reputation has taken a dramatic nose-dive in recent weeks, as awareness of the mind-bogglingly destructive scale of the world's largest industrial project has fuelled condemnation from activists, NGOs and politicians alike. There are even moves to have Canada thrown out of the Commonwealth for its appalling behaviour. In London today, activists scaled the Canadian High Commission, removed the flag, dunked it in a barrel of oil and replaced it with their own. Even here in the swanky Bella Centre, rubbing shoulders with some of the world's worst climate criminals, Canada is not safe: it keeps picking up not-so-prestigious 'Fossil of the Day' Awards for its efforts to scupper a just and binding agreement. Sorry Canadians, I know this is embarrassing for you, but we're going to keep blaming Canada until it stops this madness. Kara Moses reports on plans to dig bitumen in a 'biological treasure trove'. Noreen Sadik talks to two Human Angels, spreading compassion by giving free hugs.